Prior to flushing, give 1000 U heparin/Kg of animal body weight IV and wait 20-30 minutes. This step reduces clots and makes the following steps easier to perform. Exsanguination/flushing solution. Mix 99 parts 0.9% NaCl or PBS and 1 part Heparin (1000 µ/ml) in one sterile container (syringe). Alternatively, also add 0.1 cc Dawn Ultra dish soap per 100 ml of flushing solution. This solution will be used to flush the vasculature and exsanguinate the animal/tissue. Generally, 30-40% volume/weight of flushing solution is used. For example, a 1 Kg animal will need 300-400 ml of flushing solution. The more blood that is cleared from the vascular system, the better the perfusion with BriteVu®. *Small Rodents (mice, baby rats, hamsters, etc): Small rodents often require up to 4 times their body weight in fluids (4 L per Kg of body weight) to adequately remove blood from the vascular system. **Embryonic Animals: Many do not have clotting factors established. As a result, heparin may not be needed. ***Young (developing) animals: Young animals may have increased blood supply compared to adults and may require more (towards 40% volume/weight) flushing solution. ****Reptiles: Reptiles tend to have lower blood volumes than mammals and birds and may only need 20-30% volume/weight. *****Cadavers: Generally, cadavers have clotted blood and may require large volumes of flushing solution. Conversely, some cadavers require relatively little flushing solution to remove the clots (especially if already prepared by other methods). The amount of flushing solution and time required to adequately flush are highly variable. Consider adding 1.33 ml Dawn Ultra per 1 liter of flushing solution to aid in removing clots. ******Fish: Fish blood volume can vary significantly between species. However, most fish have lower blood volumes than mammals and often require less flushing solution (towards 20% volume/body weight). 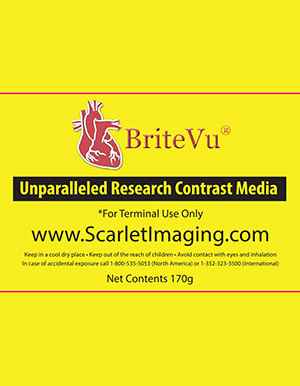 BriteVu® Contrast Media. Place BriteVu® and water (or phenol) in a beaker and mix using a mixing hot plate for best results. Generally, 30% of volume/weight will provide good perfusion. For example, a 1 kg animal should be perfused with about 300 ml BriteVu®. As a note, up to 3 times the subject’s body weight can be perfused (300 ml for a 100 g animal) to improve capillary perfusion. This is especially true of small animals such as mice (see** below). Basic Mixing Instructions: Prepare BriteVu® with distilled water. For most protocols, use 1 part dry BriteVu® (in mg) to 3-4.5 parts water (in ml). Warm water to 40-45 deg C first. 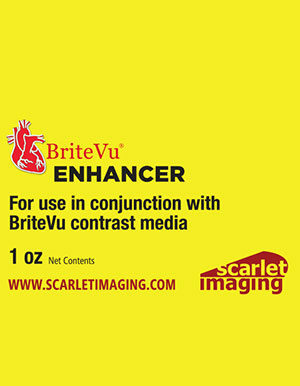 If using BriteVu® Enhancer, add Enhancer next and wait one minute. Then add BriteVu® and heat mix to 70-80 deg C for 10 minutes, cool and perfuse at 45-65 deg C.
*For best capillary and/or large animal/tissue perfusion: Large cold tissues (or whole specimens) may result in premature setting of BriteVu® -especially if the contrast fluid is perfused at low temperatures (< 50 deg C) and over too long of a time (greater than 30 minutes). As a result, large animals or tissues should be warmed to between 25-35 deg C just prior to perfusion and BriteVu® should be perfused at 60-80 deg C. Multiple perfusion sites can be used to more rapidly deliver BriteVu® in large subjects. Large animals/tissues are also prone to greater autolysis if not cooled rapidly (which is more of a challenge than with small tissues). Consider substituting water with phenol (see ‘If preservation/fixation is required‘ under Step 3) and scanning and collecting tissues shortly after perfusion. **For open vascular systems (as with cardiac perfusion and atrial laceration or individual tissues/limbs with open venous or arterial drainage): Open systems are not well pressurized. As a result, fluids will travel the path of least resistance and will rapidly exit the (open) system without flushing/perfusing the smaller vessels. For these types of perfusions up to 300 % volume/weight of BriteVu® may be needed to adequately perfuse tissues. It is always best to limit the exit site size to better pressurize the system for improved perfusion. This can best be accomplished by using clamps, tourniquets or suture to occlude draining vessels. ***For best perfusions with follow-up histology: Prepare BriteVu® with BriteVu Enhancer. Heat BriteVu® mix to 70-80 deg C for 10 minutes, cool and then perfuse at 35-50 deg C. Large cold tissues (or whole specimens) may result in premature setting of BriteVu® -especially if the contrast fluid is perfused at low temperatures (< 50 deg C) and over too long of a time (greater than 30 minutes). Immediately after perfusion, submerge the subject in ice water for 60 minutes. Once BriteVu® has completely gelled, remove excess contrast agent, trim tissues and place in the appropriate amount of fixative. This protocol will significantly reduce heat damage so that tissues can be studied histologically. Completely anesthetize the animal with Isoflurane (or sevoflourane/O2 and/or other anesthetic protocol) per your approved animal use protocol (IACUC). Trocars or other devices can be used for even larger vessels. The best location will depend on the species. Place the catheter in the direction of blood flow (towards the heart). Some species may require a cut down technique to expose the vein or artery. Catheters may be secured by a number of different means. If using tape, use radiolucent products such as 3M Transpore Tape. *If using the jugular vein: Surgically expose the jugular vein and place a 10-26 gauge IV catheter going in the direction of the heart. Tie off the descending portion of the jugular vein around the indwelling catheter using suture material. Dissect out the proximal portion of the jugular vein and temporarily clamp with hemostats just proximal to the catheter. Excise the jugular vein between the hemostats and catheter and direct the proximal portion of the jugular out and away from the body. Apply tissue glue to the catheter hub and descending jugular vein. No fluid should leak out of the jugular vein/jugular catheter interface. **If using the ventral midline vein (as in lizards/crocodilians): Follow the same procedure as with a jugular cut down described above. Alternatively, place the catheter as above and do NOT transect the ventral midline vein. However, cut a distal limb or tail to allow the flushed blood and (later) BriteVu® to escape. ***If performing cardiac perfusion (as in mice and some rats): Expose the heart via a cranial ventral abdominal approach going through the diaphragm. Place a small needle (size appropriate) into the left ventricle. Butterfly needles can be secured via a pin through each wing going either through or around the subject and into a semisolid background (such as Styrofoam). Otherwise, secure the needle to prevent movement. Cut the right auricle. Alternatively, large distal limb or proximal tail vessels can be cut (instead of the auricle) in rats and other larger rodents. It is best to attach a fluid (0.9% NaCl or PBS) filled IV extension line to the needle to limit movement. Fluids can be administered on the other end of the IV extension set with a syringe. ****If performing cardiac perfusion (as in embryonic animals): Visualize the heart through the transparent skin. If necessary, make a small incision through the skin and chest to expose the heart. Place the needle of appropriate size into the left ventricle. If flushing first, then cut the umbilical vessels. Otherwise, BriteVu® can be directly injected in the ventricle and the heart will pump the contrast agent (mixed with blood) throughout the body. *****If performing perfusion of a cadaver (whole or part): Catheterize a main artery supplying the region of interest with a large catheter, trocar or other device (depending on the vessel size). For whole body perfusion, catheterize a main vein (jugular or vena cava), multiple veins or artery(ies). Arteries and veins can be catheterized simultaneously if needed. Flush with copious warm saline until all visible clots are removed. The addition of heparin (99 parts saline and 1 part 1000 U/ml Heparin) may or may not be helpful. Some mild detergents (1.33 ml Dawn Ultra dish soap per 1 L of fluid) may also be helpful to remove small clots. If flushing a whole cadaver, a large distal vein should be cut to provide an exit for flushed fluids. Severed limbs may leak flushed fluids from multiple sites. Once large clots are removed from cadaver limbs, isolate and clamp draining veins until pressure is increased and smaller vessels become cleared. The clearing process depends on the state and size of tissue(s), coagulation present, any fixative(s) present and other factors. Complete clearing my take up to 24 hours of continuous flushing if capillaries are to be cleared. Calculate 30-40% of the animal’s (or tissue) body weight in grams – this will equal the volume (in mls) of exsanguination/flushing solution to use. Using the preplaced catheter or needle (as with cardiac perfusion), carefully flush with the exsanguination/flushing solution. The amount of pressure will vary with each subject. It is recommended to first test the pressure with your hand (and syringe). Syringe and other pumps can be used once an acceptable pressure has been determined. Excessive pressure may result in vessel rupture. By the time the total volume of the exsanguination/flushing solution is delivered, the fluid exiting the draining vein should be clear to slightly pink tinged. If there appears to still be significant blood or clots leaving the draining vein, use more of the exsanguination/flushing solution and flush until the exiting fluid is slightly pink tinged. *If preservation/fixation is required: There are numerous ‘soft fixation’ protocols that can be used to prepare a body for BriteVu® perfusion. Regardless of the protocol, it is best to flush this solution out of the body prior to flushing with BriteVu®. Use phenol 1mg/ml to perfuse through the same catheter or cardiac puncture site after the blood and clots have been cleared. The amount of solution varies between subjects; however, 10-20% volume/weight should be sufficient for intravascular preservation. Do NOT mix formalin with BriteVu® as this will cause the solution to solidify too rapidly. If formalin is present in the vasculature, flush thoroughly with the exsanguination/flushing solution to remove as much formalin as possible prior to BriteVu® perfusion. Tissues can be fixed in formalin once BriteVu® perfusion is complete. **If mixing preservative with BriteVu® Solution: Substitute water or physiologic solutions with 1 mg/ml phenol when making BriteVu® solution. The same volume of phenol can be used as with water. For best results, perfuse with BriteVu® immediately after completing step 3. Calculate 30% of the animal’s (or tissue) body weight in grams – this will equal the volume (in ml) of BriteVu® to use. 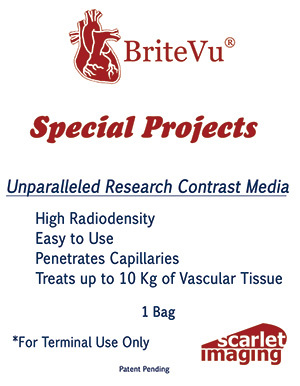 Perfuse the vessel (or cardiac chamber) with the pre-calculated volume of BriteVu® (e.g. a 1000 gram animal would receive 300 ml of the mixture). As a note, up to 3 times the subject’s body weight can be perfused (300 ml for a 100 g animal) to improve capillary perfusion. At the same time the catheterized vessel (or heart chamber) is being perfused, direct the draining vessel (or heart chamber) away from the body so as to not contaminate the tissues with contrast agent. Contrast contaminated tissues should be carefully cleaned off using warm moistened cotton tip applicators, or other non-destructive cleaning devices prior to solidification. Once the full amount has been perfused, tie catheter (using suture material) and/or cap off catheters as needed to prevent further leakage. Draining vessels should also be tied off or occluded with a pressure bandage. Once perfusion is complete, set subject aside at room temperature until BriteVu® solidifies. Any additional excess gelled BriteVu® can be removed. To speed up the solification process and reduce heat induced tissue damage (if applicable for histology), immediately immerse the subject in an ice water bath until BriteVu® solidifies. 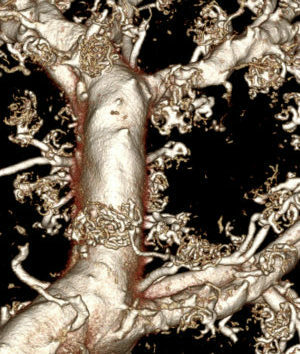 For best results, perform imaging as soon as possible once BriteVu® has solidified (usually 60 minutes after perfusion). If the subject body mass is large, allow up to 24 hours to cool in a refrigerator. If needed, the animal (tissue) can be stored in formalin or phenol and scanned later. Freezing will induce artifacts and is not recommended prior to imaging. Once BriteVu® has solidified; individual tissues may be removed and scanned or stored in fixative and scanned later.